You have only one day for visiting Krakow, but You want to see all the most important and most beautiful places? 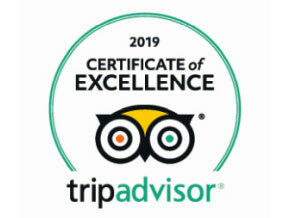 We have an offer of Krakow sightseeing, which responds to Your needs perfectly! We have prepare the route that includes all the wonders of the Old Town and Kazimierz district. This extraordinary expedition begins at the medieval gates of the city and ends in the Jewish Quarter of Kazimierz, showing all the richness of multicultural Krakow heritage. 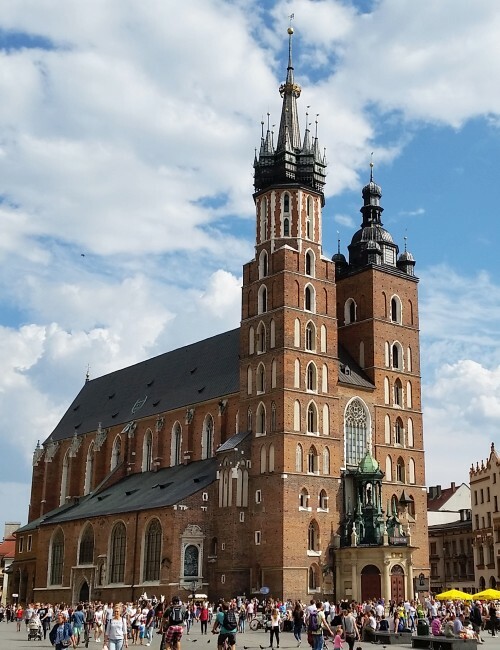 Our Krakow guide will show You the places connected with the most ancient history of the city, including Wawel Hill, the former seat of Polish rulers and the Main Square with Renaissance Cloth Hall and monumental St. Marys’s Church, whose interior hides the largest Gothic altar in Europe. Our route runs among the beautiful townhouses from different historical periods, through the streets delineated in the Middle Ages! Our guided tour lasts from 5 to 7 hours (less if You decide to hire a melex). Do not worry, we will not allow You to be hungry or tired. We offer a break for lunch while touring and promotional restaurant packages for the whole group. There is no way to see everything, what is worth of seeing in Krakow in one day, but we choose, what is the most important. Thanks to our guides You will touch the mystery of this remarkable city and feel its unique atmosphere. We are sure, that You will want to come back. This charming square is located outside the medieval city walls, in Kleparz (formerly the separate, small town). Right here, in front of St. Florian’s Church begins the Royal Route. Polish rulers solemnly entering into the city were welcomed here by the authorities, clergy and citizens (Krakow was the capital of the Polish Kingdom to the very end of the 16th century). Really picturesque fragments of the city walls – 14th century St. Florian’s Gate and the Barbican – round fortress from the 15th century (so-called “the pan”), which was once connected to the gate and now is just surrounded by a moat. What happened to the rest of the Krakow walls? Unfortunately they were demolished in the 19th century. A beautiful street running from St. Florian’s Gate to the Market Square. One of the most important routes in the city through all its history. At the end of the street You can see an impressive view of gigantic Gothic basilica – St. Mary’s Church. Krakow Main Square was set in the 13th century, when the city was invested on the Magdeburg Law. Visiting all monuments and museums located around the Market would probably take all day! The vast space, wonderful architecture of the buildings surrounding the market and the unique atmosphere of this place makes a great impression. This great market hall occupies a central space of the Main Square from the Middle Ages. 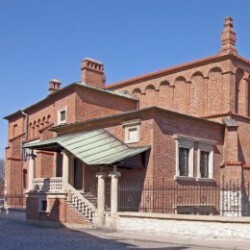 It was rebuilt in the Renaissance style in the 16th century. Be sure to pay attention to the finesse of architecture – graceful arcades designed by Giovanni Maria Padovano and beautiful attics by Santi Gucci, two excellent Italian architects. The hall retains its original function (at least partially) – it is still a place of trade – stalls are located in the inner gallery. The main church of the city built in the 14th and 15th century. Every day, every hour the special trumpet call is played from one of the windows of the higher tower. The call (always interrupted for a while) commemorates the death of the watchman, who was, according to the legend, killed by an arrow during the Tatar invasion in the 13th century. In extended option of sightseeing You can see the interior of basilica, including the famous altar by master Veit Stoss of Nuremberg. The only relic of medieval Krakow Town Hall, demolished in the 19th century because of serious structural damage. A significant example of Polish Gothic architecture. Nowadays, the lonely tower recalls the times of the greatest glory of the city. One of the oldest Krakow routes. In the Middle Ages it connected the exact city (invested in the 13th century around the Main Market) and the old settlement surrounding the Wawel Hill. Buildings remembering almost all historical periods, people speaking languages from all over the world, street musicians, horse-drawn carriages – this is an amazing view You will see and probably will not forget. The first baroque church in Krakow. The astonishing architecture recalls the Roman churches – Santa Susana and Il Gesù. The vault ceiling is so high, that every Thursday the spectacular shows of the Foucault pendulum (46,5 metres long!) are organized in the church. You will be delighted by its subtle facade and magnificent sculptures of the Apostles situated in front of it. In the Middle Ages cathedral canons (members of the cathedral chapter) lived in houses located on this street. Each of the townhouses has its own rich history. Architectural details (dated from the Middle Ages to the 18th century) are truly dazzling. You may be also interested in fact, that Karol Wojtyła (the future pope John Paul II!) lived here for many years. The first settlers in the area of Krakow appeared thousands years ago, probably right on this naturally defensive, limestone hill by the Vistula River. For centuries Wawel was the centre of authority. Nowadays, it offers absolutely remarkable number of astonishing monuments. Probably the most significant church in Polish history. In the Wawel Cathedral our kings held their weddings, coronations and funerals. Their mortal remains lie here in magnificent tombs. Extended tour includes visiting the crypts and the tower, where the famous 16th-century Sigismundus Bell is hanged. Cracovians believe, that touching his metal heart brings luck and can make whispered wish come true. The splendid residence of Polish monarchs. 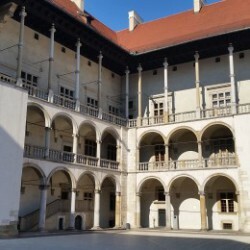 We will see the beautiful Renaissance inner courtyard of the Wawel Castle with its three-level arcaded galleries following the Italian architecture and designed by Italian masters. The most famous Krakow legend is associated with a large cave hollowed out by Mother Nature in the slope of Wawel Hill. The story (well-known from the Middle Ages) says, that there lived a horrific dragon finally defeated by a shoemaker. 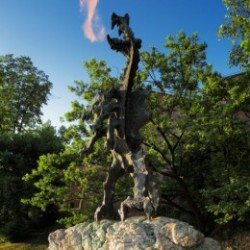 You will hear the whole legend, when we get to the statue of Wawel Dragon near the mouth of the cave. The place, where in the 11th century Krakow bishop Stanislaus was murdered by the order of the king Boleslaus II the Cruel (also called the Generous). Some chronicles say that the king cut off bishop’s head personally, attacking him at the altar. Nowadays, there is a monastery and a splendid, baroque church, whose crypt is from the 19th century a national pantheon. Skałka was our first stop in Kazimierz, a gigantic, 14th-century St. Catherine’s Church is the second. Earthquakes are rare in Poland, but this magnificent building has suffered from seismic twice! The construction have never been completed. Despite this, monumental form of the church and its wonderful architectural details are stunning. Through St. Joseph’s street and the old, picturesque market square called Plac Nowy we will get to the Jewish Quarter of Kazimierz. Jews was settled here at the very end of 15th century. The first object we will see here is 17th-century Isaak Synagogue. 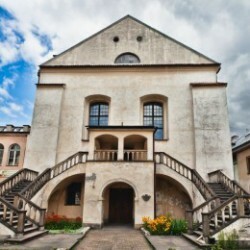 It is one of the seven preserved Krakow synagogues. 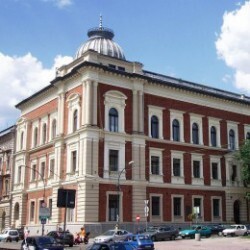 The impressive, baroque building was founded by a rich merchant, Isaak Jakubowicz. The oldest synagogue located in the heart of Jewish Kazimierz – on Szeroka street with its unique, a little bit exotic atmosphere. One of the most important monuments of Jewish religious architecture in Europe. The building contains the original Gothic and Renaissance parts. A small Reneissance building of a huge religious, cultural and historical significance. 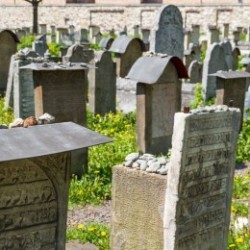 The cemetery surrounding the synagogue is one of the oldest Jewish necropolis in Europe. There is a 16th-century grave of famous Rabbi Moses Isserles visited by Jews from all over the world. We can see it during the extended tour, as well as the interior of this still active synagogue.